After all those years, the final verdict felt like a blessing. Despite all the testimonies and examination, it never felt like any progress was being made, until suddenly, out of nowhere, salvation arrived. From the smallest of places, it grew and grew until the evidence was too strong to ignore, and the judge soon found no choice but to agree, and so at the end of our seemingly-endless trial, he finally laid down his judgement: there would be another Ace Attorney. 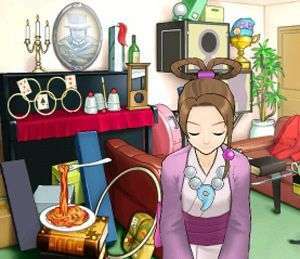 With five years passing since the previous main entry in the series, and three years since spin-off Investigations: Miles Edgeworth was released – although everyone outside of Japan is still waiting for its sequel to be localised – you could be forgiven for thinking that we wouldn’t be walking the hallowed halls of the courtrooms again, but despite all odds, Ace Attorney is back, and it’s better than ever. Set a year after the events of Apollo Justice: Ace Attorney, Dual Destinies starts off with Phoenix Wright assisting Apollo and new recruit Athena Cykes in his triumphant returns to the court. While there’s a great deal of back-story as well as various nods and winks to the games before it, players could conceivably step into the world of Dual Destinies and not miss too much as, for the most part, any required knowledge will show up in the form of a flash-back. Players can come into this adventure with a passing knowledge of the original trilogy, but a good deal of the plot involves more than a few passing memories of Apollo Justice and, while you can be bought up to speed without them, it does help ease players in considerably. For the uninitiated, the action is broken down into two key segments – trials and investigations. 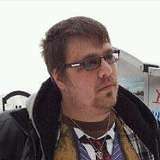 The first case is solely comprised of the former, but mastery of both sides will be key to see your clients exonerated. Investigations require players to explore the crime-scene, talk with key witnesses and gather as many clues as possible before heading into the courtroom, and this is one of the areas where some of the most key changes to the series have occurred. Previously, players would only be able to move between directly-connected areas, meaning that reaching some of the farthest places prudent to the case could see you changing locations several times just to get to the one location you need, which could occasionally kill the pacing somewhat. Instead, players can now instantly relocate to any area that they’ve previously visited, cutting down travel time significantly. Additionally, players will only be required to examine their surroundings in one or two key locations every case, streamlining the investigative process and allowing everything you check out to be pertinent to the murder at hand. On top of this, all hot-spots will be highlighted when you move your cursor over them – either via the touch-screen or the control-stick – and anything you’ve previously looked at will show a tick when its highlighted again, saving you the occasional past frustrations of either accidentally selecting something you’ve already done before or pixel hunting. Finally, the age-old issue of running around like a headless chicken trying to figure out who you still need to talk to or what to do next has been solved with the simple addition of a ‘To Do’ list. Accessible when looking at the Court Record, this simple feature will give you a bullet-pointed list telling you outright who you still need to exchange words or clues with, alongside any evidence you need to present to them. There’s absolutely nothing stopping you from abusing this to find out exactly how to proceed, but I often found that the protagonist’s thoughts would strongly hint at what you needed to do next regardless, making it more of a friendly reminder. Either way, it’s a great time-saver and a brilliant, and long-overdue, addition to the series which fits into the action perfectly. As for the iconic court cases, these have had a couple of new additions which help breathe life into some of the series’ most intense moments, as well as the return of several older mechanics. For one, the ‘save’ command is ever-present at the bottom of the screen, making it easier for players to record their progress or return to the title screen, while all of the recent dialogue is transcribed and accessible via the button next to it, tracking the last few conversations, allowing them to pick up and decipher clues, or to remind themselves of the events at hand if they load their save file. By far one of the most welcome features is the ability to skip and speed up dialogue without having to have previously completed the case in order to do so, speeding up the pace considerably if you don’t want to sit and wait for all the text to appear on-screen of its own accord. The biggest change comes from new protagonist, Athena Cykes, who is an expert in analytical psychology, allowing her to pick up emotions in the voices of others indiscernible to those around her. When this happens, her and her robot companion Widget activate their Mood Matrix, tasking the player with listening through the witness’ testimony and picking out emotions that are conspicuous by either their existence or absence. This mechanic feels like an absolutely ingenious new inclusion, as it comes across as the most natural evolution to a series that doesn’t contain full voice-acting. 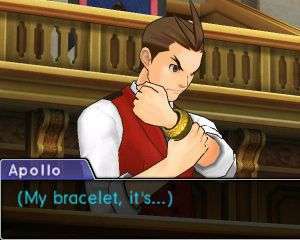 Apollo’s bracelet makes a return – allowing players to perceive witness’ tells during their testimonies in order to expose lies – and is used more sparingly than in his titular adventure, meaning it’s used in more pivotal moments and doesn’t outstay its welcome. The same can be said of Wright’s Magatama, which allows him to break people’s psyche-locks to expose their innermost secrets. The health bar also makes a return, granting players a limited number of chances to make mistakes when preventing their clients from being indicted. In the past, riskier bluffs would take a bigger chunk out of the bar if they were unsuccessful, but in Dual Destinies this only ever occurs once, meaning that, while it’s still present, it’s far less prominent in the pass, and makes the difficulty more balanced as a result. For those still struggling despite that concession, players can call on their in-court assistant for a consultation if they’ve made too many mistakes on a certain testimony, in which case they’ll point out the particular statement that should be pressed on or contradicted, although this won’t help if you’ve already figured that part out but aren’t sure which piece of evidence to present. As a result, there’s still the age-old issue of occasionally having to present each piece of evidence until you stumble upon the right one, but saving before you do so in case you run out of chances. Admittedly, I only found myself needing to do this two or three times throughout the entire game, with at least one of those occurrences resulting in me not having presented a piece of evidence that I thought I had. The emphasis on evidence is more important than ever, and cases will absolutely and unequivocally require everything to be proven with cold, hard facts. Those who’ve finished Apollo Justice may find themselves slightly confused by this, considering its main story-arc concerned itself with how desperately that system needed reform, seeing as it lead to falsified evidence and erroneous sentencing, with the final case introducing a solution and setting up future titles in a way that promised a new approach to the trial system. Instead, these developments seem to have been completely ignored, despite it contributing directly to specific plot developments in Dual Destinies and that final case in particular being mentioned several times in relation to Phoenix himself. It’s baffling that while a few plot points from Apollo Justice are preserved, many others are completely ignored for no adequate reason. “No adequate reason” can also be levelled at the presence of one of the returning characters, as while three characters from previous games make a returning cameo, the inclusion of one of these feels entirely like lip-service pandering to the audience, rather than having any vital impact. What makes it worse is that the presence of two of these characters actually has significant bearings on the two cases where they appear, while the third is present for two scenes, contributes absolutely nothing other than a poorly-delivered tease for any potential sequel, and actually causes more issues through their inclusion than if they’d never appeared at all. 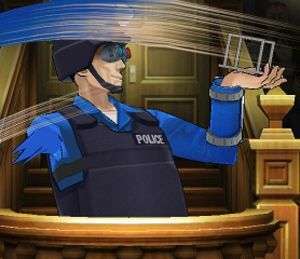 Despite being so notable in their absence in Apollo Justice, their presence in Dual Destinies feels shoe-horned, tacky, and doesn’t do anything to explain their eight-year absence. This is made even worse by the fact that, instead of explaining where they’d been and what they’d been up to in their time away, the game instead tells you that they’ve met all the other protagonists several months prior, which feels completely superfluous as that character then never goes on to meet anyone else anyway, making that revelation utterly pointless. Both the squandered cameo and the apparent retcon of certain events in Apollo Justice stand out even more because, despite these issues, Dual Destinies has easily the best story of the series, concerning itself with “The Dark Age of the Law” – an era where no-one trusts the judicial system thanks to rampant evidence falsification and tampering, as well as the increasing number of erroneous convictions. The situation is also exacerbated by the fact that both prosecutors and defence attorneys are being taught that “the ends justify the means” and a prisoner is able to stand as a prosecutor despite being convicted for murder. Yet, Dual Destinies also manages to spin quite a personal tale, allowing all of the protagonists – Apollo and Athena especially – their own story arcs, which manage to be far more emotional using a handful of animations and text than David Cage can manage with all the polygons in the world. Similarly, the writing is absolutely stellar and, aside from the wasted cameo, there’s not a moment where the dialogue or transpiring events feel lacklustre or under-developed. Instead, almost every single comic moment hits its mark, every conversation feels important, and not a single case feels predictable; in fact, it’s far more likely that any attempts at second-guessing will fall flat, and even the dying moments of a trial will keep you guessing and constantly surprise. 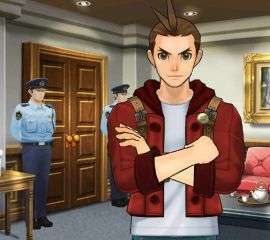 Aiding the writing is the fact that Dual Destinies is structurally very similar to Trials and Tribulations thanks to the use of multiple protagonists and several cases taking place before others chronologically as well as tying in to a larger plot, allowing the scripts to feel tightly focused and keeping the player enthralled at all times. In a first for the series, there is also a myriad of animé cut-scenes scattered throughout the story, bringing life to sequences that couldn’t otherwise be shown. The art style for these segments is fantastic, the voice-acting works brilliantly even though it’s initially odd to finally hear well-established characters speak, and if Capcom don’t go on to make a film or series in that same style then it’d be a crime worth going to court over. These are all available to watch again once the final credits have rolled, but admittedly there’s not too much reason to do that other than to feast your eyes on the wonderful animations, which look amazing even with the 3D on full. 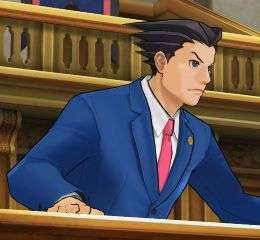 In fact, Dual Destinies marks the series’ transition from pixels to polygons, and passes with flying colours – everything is colourful and beautifully-realised, and the 3D effect helps makes everyone and their actions stand out all the more, although everything still looks brilliant in two dimensions, even if it lacks the ‘pop’ of the third. When it comes to the music, the Ace Attorney series has always had its iconic tracks, and this iteration is no different. New songs help convey new locations and characters, but it’s when the music reaches back into the archives that it feels most at home; my spine couldn’t help but tingle when the familiar ‘Objection!’ tune began to blast, bolstered by an orchestra. Sometimes, though, it’s the lack of music that can make all the difference, with some intense or emotional moments given more impact when the track jolts to a stop and silence creeps in. 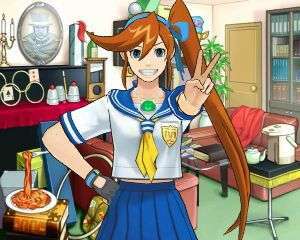 Capcom could easily have made the newest Ace Attorney just more of the same, and in many ways that would have been perfectly fine, but what makes Dual Destinies stand out high above the rest is the fact that it’s very clear that they made a concerted effort to address major complaints that could conceivably be thrown at the series. All of the previous issues I’ve had with the gameplay have been dealt with and, despite my grievances with a particular cameo and the way that part of its own history are willingly ignored, the story and writing are far and away the best in the franchise. Those who’ve yet to throw themselves into the legal world of Ace Attorney could do a lot worse than to start here, but for fans like me, this is the greatest return to form I could hope for. A stellar return to form for Phoenix Wright and co. Contains far and away the series' best story. Amazing script and writing that will keep you constantly guessing, laughing, and at the edge of your seat. Art style loses nothing in translation from pixels to polygons. Anime cut-scenes that are simply begging for Capcom to make an Ace Attorney film or series in that style. Full of gameplay additions specifically designed to fix issues that plagued previous entries in the series. Mood Matrix is a brilliant innovation that feels like a natural evolution of the series and never outstays its welcome. Perfectly balanced difficulty that provides enough hints without babying the player, while keeping them challenged in court at all times. Seemingly retcons or conveniently ignores elements of the plot from the game it acts as a direct sequel to. One pointless cameo that serves to confuse and weakens the story from their inclusion. Some new characters aren't as memorable as the older ones. Can still end up occasionally having to use everything in your evidence until you stumble on the right solution. Despite a squandered cameo and a willingness to ignore moments from the series' history, Phoenix Wright: Ace Attorney - Dual Destinies is a fantastically-written story from start to finish, featuring plenty of tension, emotion and an ability to constantly surprise and reward you. It doesn't just address all of the franchise's major concerns, but introduces new ideas and mechanics that soon feel like integral parts of the gameplay. For new players, this is a wonderful adventure that will introduce you to a world of colourful, quirky characters, murder cases full of intrigue, twists and turns, and jokes, art and music that will think nothing of burrowing into your brain and never letting go. For fans, it's everything we could have hoped for and more; it's an almost-perfect return for the Ace Attorney series. I love the Phoenix Wright series,never got to play the Apollo Justice or Edgeworth games though, which is quite upsetting. Absolutely loving this new one, even though I’m only on the Monstrous Turnabout case.